If you would like to extend your composter, why not use our Slot Down Compost Bin Extension Kit to add one, or more, sections to your already existing bin. If you are an avid gardener, the Slot Down Compost Bin allows you to make use of your kitchen scraps, and the slot down design makes accessing your compost much easier than a regular bin. These composters hold approximately 650ltr of green waste each, and the rustic nature of the rough sawn boards mean it will blend well with any garden setting. All timber used has been pressure treated to give a 15 year guarantee against rot and fungal decay, which is essential when in contact with moisture. 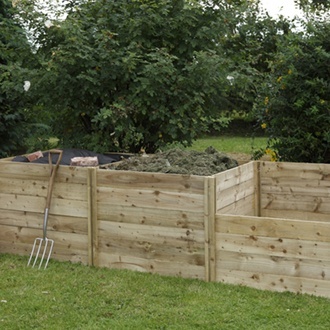 To access the compost simply remove the individual side boards. - Delivered to you flat packed with easy to follow step-by-step instructions and all the fixings you need for a simple build. Delivered within 7 to 10 working days* to UK mainland (*Scotland 21 days). Unfortunately, we are unable to deliver to Scottish Highlands or offshore islands (including Isle of Wight and Isle of Man). You will be contacted via e-mail/telephone by our partner Forest Garden with a website link enabling you to pick-a-day for your delivery. Please ensure that you provide a daytime telephone number and e-mail address (preferably both) to make the delivery possible. If you've bought this product from us previously, we'd love to hear how you got on with it. Even just a star rating allows us to better evaluate which products our customers like and want to see offered within our range. If you can spare the time to add a note, better still - growing tips which might benefit other customers are especially welcome!